Step aside chicken noodle soup, here comes the Instant Pot chicken congee! 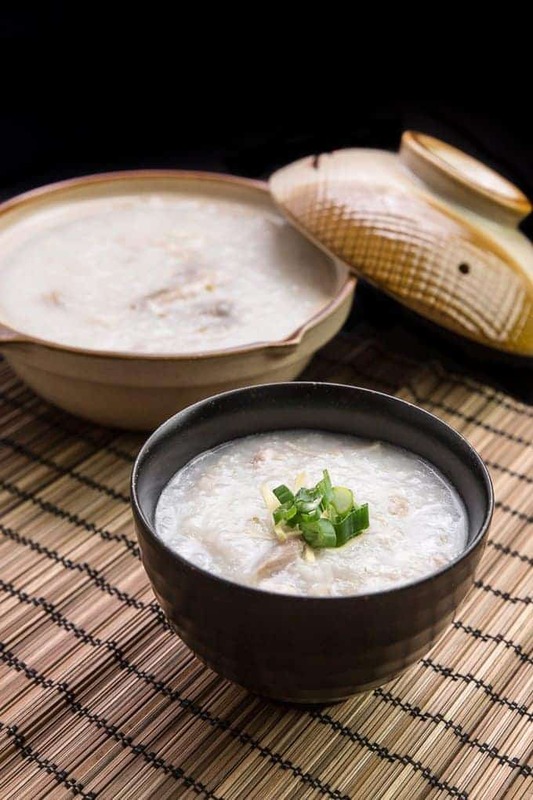 Congee, also known as Jook, is a rice porridge that has thousands of years of history in the Chinese culture. It’s the ultimate “feel good” comfort food that we crave for when we’re not feeling well or when it’s cold. You’ll definitely feel an instant soothing effect with a good warm bowl of congee. 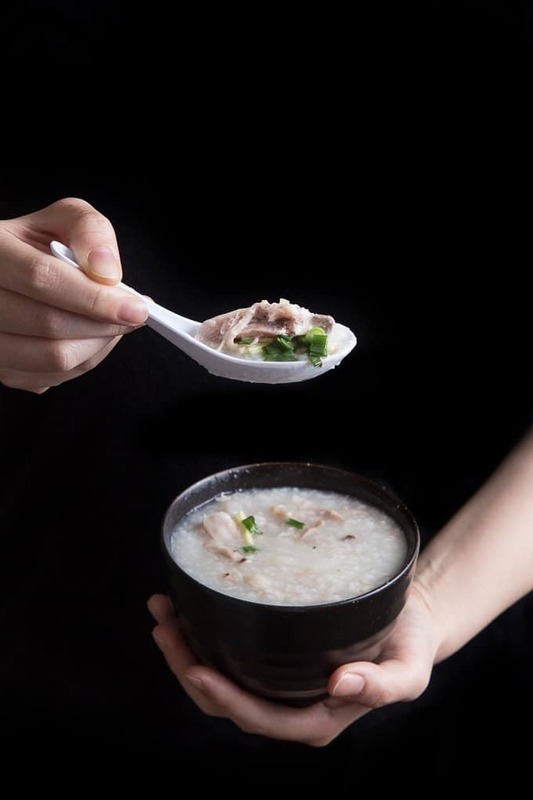 There are endless variations on how you can customize congee, but chicken congee has to be one of the most popular congee of all. There’s just something about the chicken congee that makes it extra comforting to eat. If you prefer a flavorful yet meatless congee, try our Comforting Pressure Cooker Congee. With just 6 simple ingredients + 6 easy steps, this is seriously one of our favorite go-to lazy one pot meals. We tested the difference between cooking the chicken and rice together and separately. After many tries, we finally came up with this easy dump-it-all-in recipe :)! Now it’s YOUR turn to take out your pressure cooker and cook some Chicken Congee in Pressure Cooker! Last Updated: Sept 16 2017 – Modified Rice measurement to using standard glass measuring cup. Rinse 173g (3/4 standard cup) of rice in the pot under cold water by gently scrubbing the rice with your fingertips in a circling motion. Pour out the milky water, and continue to rinse until water is clear. Drain well. Close the lid immediately and cook at high pressure for 30 minutes + Natural Release in an Electric Pressure Cooker. Open the lid carefully. The congee will look watery at this point. Heat up the pot (Instant Pot: press Sauté button), stir until desired thickness & consistency. Season with salt. Use tongs and fork to separate the chicken meat from the bones (they literally fall off the bone) and remove the chicken bones and skin (if desired). Remove congee from heat and garnish with green onions. You can easily customize the congee by adding toppings like crispy garlic, fried shallots, roasted salted peanuts, soy sauce, fish sauce, etc. I love your site! I would like to make this with 1cup rice and 9 1/2 cups of water. What should the cook time/natural release time be adjusted to? Thanks for sharing so many delicious recipes with the IP community! The cooking time will stay the same for this recipe. I would like to try this using glutinous rice, do I need to mb ake any adjustments? No changes is needed. I recommend using 1/3 part glutinous rice to 2/3 part Jasmine rice for extra texture. I want to cut the quantity of this recipe in half. What would be the cooking time? Wow! Never thought of Instapot congee. I added pork belly (in lieu of chicken)- cubed it (bite sized) and sauteed it briefly before cooking as above. I also used a submersion blender to get a nice consistency. Done in less than 1 hour. Terrific!!!!! Thanks for this. I tried the exact recipe above and it turned out great! For a 6 qt IP, what would be the max ratio to yield the most congee in one batch? Add ginger, 5-6 chicken drumsticks and 6.5 – 7 cups of cold water (using standard 250 ml cup) into the pot. Do not add salt at this point. (The ratio is 1 cup rice to 9 – 9.75 cups of water)”… do you also add the rice at this point. None of the steps add the rice to the pot. Thanks! The rice is added and rinsed in the inner pot on the first step. What more do I need to say? This hits EVERY comfort need! I made mine with a bit less rice because I like mine a bit thinner. Perfect recipe! Hey you guys this recipe is awesome. we use 8 chicken thighs(de-skinned) instead. Gives it even more of a chicken flavor….But can we use brown jasmine rice? Are there any different instructions if we do? Thank you so much for your love and support. Brown jasmine rice will work, but you may want to reduce the water by a cup as Brown rice congee is usually thicker. Ok thank you for the advice. And a Happy New year to you both and thanks for this amazing website !!! Can we substitute some or all of the water for chicken broth(for either white or brown rice)? Hey guys, cooked this before and it was great. Attempting it again. for a fillipino friend. Just wondering if theres any particular fillipino flavours that would work in this recipe. Also if I can increase the portion size without any variance on the guidelines. thanks. I’m so grateful to have found your recipe! I used 7 cups of chicken broth instead of the water, and I noticed after the 30 min cook + 15 min natural release, the congee thickened a lot faster. If we find that we want to add more water/broth after the initial cook time, what’s the best approach? Thanks again!! This totally made my day after being sick for a week! You can just add in more water/broth during step 5. Wishing you a speedy recovery 🙂 ! I just want to say THANK YOU!!! I just received my Instant Pot last week and this was the first recipe that I tried. It reminded me so much of my childhood spent in Singapore, as this was usually what I would have for breakfast! Can’t wait to try out more of the recipes you have here! Congrats on your Instant Pot and thank you so much for your kind words! I have tried the congee recipe, and it came out perfectly. It reminded me of my favorite breakfast spot in Zhanjiang. The first time I had congee was many years ago, in Hong Kong. While living in Guangzhou, I searched for a place that served a good bowl of congee and found small Mom and Pop places had the best. This recipe is just like those shops. I tried the congee that KFC serves on their breakfast menu in China, and it was terrible. Now I have great congee whenever I want. My wife is from the Philippines and rice porridge there is called Arroz Caldo. We use the same recipe with a few different spices and it comes out great. Happy to hear you enjoyed the congee!! Hi, can this keep in the fridge for meal prep? Could I make this on sunday, and have it for breakfast daily for the next 5 or so days? Freezing it will be a lot safer as cooked rice shouldn’t be store in the fridge for more than 2 days. Hello Amy and Jackie, I love this recipe! Easy and delicious. Any advice how I can adapt this to make fish congee? Appreciate any thoughts. It will depend on what fish you want to use. I will add some ginger and fish bone to pressure cook along with the congee and then add in thin slices of fish to cook on saute mode in the end. I’d like to make more than 7 cups serving (as per your recipe), say for about 8 people (16 cups), how many cups of 250ml cup rice should I use and water ratio? Thanks! You can use 1 3/4 cup of jasmine rice and 16 cups of water. Note: This portion will be too much for the 6 quart Instant Pot. Thanks for testing so many awesome recipes. I got an IP four days ago and I’ve already tried a few of your recipes! My question is that I’m used to eating chicken congee where the chicken has been marinade. Without marinating it, would the meat taste bland? The chicken will taste fine as the seasoning in the end will also seasoning the shredded chicken meat as well. You are both geniuses in my book! I’ve made jook for years and could never duplicate the perfect jook found in a restaurant while visiting family in San Francisco. That restaurant has since closed. Your recipe and method has won out anything I’ve ever tasted. I used 1/2 of my turkey carcass and added 2 chicken drumsticks, dehydrated bean curd sticks (thick type), and shiitake mushrooms. WOW!! You won me over. Mahalo for sharing. I was also intrigued with the different varieties of jook at this San Francisco restaurant eg…among them salted pork bone, shredded duck, shredded pork (which was similar to Hawaii’s kalua pork). Would you happen to have a recipe for Chinese lamb stew with dried bean curd? A little Chinese restaurant in Honolulu made the best, and now has closed also. We have tested Chinese lamb stew in the IP for a few times already and we hope to publish a recipe in the near future. This jook came out fantastic! I followed the easy and precise recipe and the texture and consistency was spot on like my Mother’s stove top version. I omitted the chicken since I’m vegetarian. I cut the ginger into matchsticks and let the IP do the rest. Garnished with sliced green onions, cilantro, soy sauce, white pepper and toasted sesame oil. I wish I had the Chinese donuts to dip! Thanks! Thank you for this recipe! Excuse my ignorance, but do you have to cook the chicken drumsticks (parboil???) before putting them into the pressure cooker? I saw that you cooked the pork before hand in your other recipe and a lot of reviewers used Costco cooked chicken or turkey carcasses. If you are supposed to cook the chicken ahead of time, should I follow your directions for cooking the pork in your other congee recipe? Thanks so much and keep up the fantastic work that you’re doing! Chicken is more mild in flavor so it is best to not parboil beforehand as it will dilute some of the flavor. Hi A&J, love this recipe and it is clearly an international sensation of a dish by the comments on your site. So I didn’t grow up with this simple dish but learned later from my mother a few years ago that she likes it when you are sick and need something easy to eat and digest. My mother is very old now and frail so I have been making this for her but with some twists. I am making this with Japanese rice and with the carcas of a Costco roast chicken ( breasts and leg/thighs removed and saved for other meals). It is heavenly and so easy to make. Here are my adaptations: 3/4 cup short grain rice rinsed, 4 cups water, 1tsp salt and 1 Tbs + of fresh matchsticked peeled ginger root and broken up Costco roasted chicken carcass. Don’t forget to rinse the tray of the chicken of the great juices with some of the 4 cups of water and put it into the IP. 30 min on High pressure with 20 min natural release. You will need to pick out bones before serving or at least mention to your guests that they may find bones in the soup but the skin and other stuff just melts into the Jook and is so silky! Try this with your Thanksgiving Turkey carcass or leftovers. You can freezer his btw! I have some leftover turkey. It’s already cooked, should I put it in at the end when we start the sautee process? How should I adjust the recipe? It is best to put some of them in before pressure cooking so the congee will have some of the turkey flavor too. Your recipe has perfect ratio of rice/water. I have made congee once before using another recipe, and it came out very thick (kinda disgusting) with 1:4 ratio of water to rice, I searched for other recipes and they all kept that ratio, until I found and made yours. It was a perfect consistency, flavorful bowl of congee. It took me back to Monterrey park (Near LA) little mom and pop restaurants where I would order a bowl every time. Thank you. This is a terrific recipe. I made mine with frozen , boneless, skinless chicken thighs, a carton of unsalted chicken stock, a carton of unsalted chicken broth, minced garlic, minced ginger. The first time I used Jasmine rice but the second time I tried short grain rice…it is still cooking so I will update how I liked it. I LOVED the first one I made, so so good. After it was done cooking I added some sea salt, a little sugar (not much), fish sauce and Chinese red vinegar. The additions didn’t alter the chicken and rice flavor much, just added some layers of umami. This will definately be a go to recipe for me from now on. Since I used cartons of broth and stock, I measured them to see how much I had, and it came to eight cups of liquid. Because of this I upped the rice amount to 1 cup and it worked just fine. Honestly, this tastes exactly like the chicken and rice my mother used to make when I was a kid. She had no recipe for it and since she has passed on I never could figure out how she made it. The Campbell’s Version of Chicken and rice is completely different and uses cream of mushroom soup. But this, this is the EXACT consistency of her chicken and rice. It takes me back to my childhood. Thank you! thank you for sharing your lovely childhood story with us and thank you so much for your kind words with the recipe. How long do you pressure cook with fro,en chicken thigh? The cooking time will be the same for this recipe. Make sure to submerge the chicken thighs fully in the liquid. I plan to create a vegetarian version with seaweed and mushrooms in it for my oldest son…he is a seaweed fanatic. Am not sure what I will use for the protein yet…I might not even bother. I know a lot of Korean jook recipes just use veggies. I want to try making this recipe tonight. Have you tried using brown rice instead of Jasmine rice? If so, what are the different time pressure times, and how much water? I would recommend reducing the water to 5.5 cup. The cooking time will be the same. I just got the pressure cooker and this was the first thing I tried. I tasted great! Thank you so much for your recipe and I will continue to try out your others. I just have a question, when I finished cooking the congee on high pressure for 30 mins, I released the pressure with the little nob. All the congee condensation and pressure was shoot all over my counter and cabinets. How would you prevent that? I got a bit messy. For foamy food or food with a lot of liquid, you will want to do a natural release (Not turning the venting knob to venting) for at least 15 – 20 minutes. I just made this for my husband who was feeling sick. My first time making congee and turned out perfect even with no salt, thanks so much for the recipe! Hope your husband has a speedy recovery. Do you have the valve closed or open on the instant pot for porridge? The valve is closed when pressure cooking. skinless or skin on drumsticks? Skinless or Skin on drumsticks will both work fine. I prefer skin on as it protects the meat from drying out. This recipe is AMAZING! I lived in China for 3 years and it was just like being back in Wuhan. I have a giant bag of forbidden rice and wanted to try it again using it. Would I need to adjust liquid ratio or cooking time using it? First time I made rice porridge and I came to your website since I use so many of your other recipes! It was delicious! I added 7 drumsticks since the Costco portions come packaged like that and I added 1/4 cup fish sauce instead of salt. Thank you for your recipes! Great idea! Fish sauce works great with this recipe. Quick story. I was a sea captain working in the Middle-east some years ago. On days when it was rough seas, the Indian cook or Filipino cook would make what they called “sea sick soup.” I really liked it, but never inquired how it was made or the correct name. After being home and taking an interest in cooking, I thought about the “sea sick soup.” I searched and hunted but never found a recipe for it. Then one day, I stumbled upon a recipe for jook. I was very excited as I had found my lost recipe for “sea sick soup.” Here in America, it is call porridge and oatmeal is used instead of rice. I hope to give this a try soon. Enjoy your site and roaming through your recipes for my new IP. Thank you so much for sharing this story with us Charles! Yes, the cooking time will stay the same usually. For recipes with only 1 cup or less liquid, you will want to keep all the wet ingredients the same and decrease the meat portions. Let us know if you come up with any questions. I had a little ham and the hambone that i didn’t want to throw out so I substituted that for the chicken. Such a simple recipe, with limited ingredents, but full of flavor! Yours is the first blog I go to when I want to learn something new to do in my IP. Thanks!! So, I made this today. I used 1 cup of brown rice, 8 cups of 1/2 stock 1/2 water, 3 (frozen) leftover rotisserie chicken drumsticks, and 1 (frozen) smoked turkey wing. I also added 1 cup of (canned, because I’m out of fresh) mushrooms. It came out more soup-y than porridge-y, but is delicious. I mentioned it to my mom, and she said it’s basically what she used to make with the Thanksgiving leftovers – she called it Chook. It used the turkey carcass (with whatever dressing and gravy stuck to it), rice, chicken stock, and some chopped aromatics (onion, celery, carrot). She’d boil it until it was a thick soup. Your Congee tastes very similar. I used the idea from a poster above, and pour a serving over an egg, then stirred the egg in. It was amazing. I’ll be making this again (maybe with a little less liquid) and again, it was so good. I know what I’ll be taking to work for lunch this week. Hehe yes. The Chinese word for congee is Chook or Jook. Thanks so much for your recipes! I’m making congee right now 🙂 I’m wondering why you use manual button versus the porridge button? Many of your recipes (and other bloggers too!) say to just use the manual button, but then why would the instant pot include all the other buttons? Most of the Instant Pot buttons are preset buttons so the difference will be minimal. Hi, how do you recommend adjusting the recipe if using up leftover cooked rice? Thank you! For cooked rice, I would recommend reducing the water ratio to 1 cup of cooked rice to 4 cups of water. You can bring the cooked rice and water to a boil and simmer until desired consistency. Can you add dried shiitake mushrooms with the chicken or do you need to rehydrate them first before we cook it? Also, I wanted to add bean curd to the soup, but not sure to add it dried or rehydrate them first? Do I add it to the initial phase or add it it at the end when soup is all done? Also, If I used 5 drumsticks, can I add sliced pork roast( raw) with the same cook time? Thanks for your help! If necessary, dried shiitake mushrooms can be pressure cooked without rehydrating. For bean curd, it is better to rehydrate them first. Thank you Amy+Jacky for another recipe! I had congee for the first time two weeks ago (why did it take me so long!?) and was so happy to see that my most trusted food bloggers had several recipes for my beloved IP! My family loved this and will keep it on rotation. All we added at the end was a little bit of salt, a few drops of sesame oil and green onions. yum yum! Better than bouillon vegetable base (really just concentrated veggie essence and salt) – to taste ~2-4 teaspoons- I added during cooking, but could add at end to taste. Hope someone can enjoy this relatively ‘vegan’ version!!! This recipe was great with white rice but how do I change it for brown rice? Thx in advance! Thank you so much for this recipe! My stomach is wreaking havoc on me right now and I was craving some good ol fashioned jook, like mom used to make. Thanks to you, I don’t have to trek to Chinatown and will be enjoying some in about 30 minutes! I found your website by looking for Instant Pot recipes and all the recipes that I have tried came out great. Thank you again for the recipes with great instructions! I made your plain congee for my children a couple of weeks ago and they loved it! I’m going to make the chicken congee today. I read in the comments that people add sesame oil and fish sauce. Would you add this to the pot for cooking? If so how much would you recommend? Also, I have bok choy that I need to use. Would it compliment this recipe? You will want to taste and adjust the seasoning with the fish sauce accordingly. Happy New Year to you and your family once again!! It sounds like the floating pin was stuck. If steam was flushing out of the venting knob, check to see if the venting knob is in sealing position. Then you can poke the floating pin with a pen or chopstick to see if it was stuck. Hi Amy. My husband gave me an instant pot over Xmas and finding recipes led me to your site. Could I substitute with chicken breast and basmati rice. I bought a Costco size of them and want to use them up. I’m excited to try your recipes! With chicken breast, the congee will have less chicken flavor, but it will be okay! Throw in some chicken bones if you have them on hand! Wow this was unbelievable! I got my electric pressure cooker for Christmas and I don’t think the stove has been used since, I am loving pressure cooking so much! I have a lot of issues with food, essentially I am highly allergic to so many things in nature that I get a lot of symptoms that carry over to my food. Basically, I end up eating a lot of rice in many different ways and have been looking for simple recipes from other cultures to make for flavorful meals. Once I read about congee on Pinterest, I soon found this recipe and made it immediately. It was so easy, and so DELICIOUS! I can’t believe it. I did read through the comments and added some sesame oil and Liquid Aminos as I love those flavors. Actually, the entire family (me + husband + 5 kids including a toddler) loved this yummy meal. Thanks so much for sharing, I will be checking out your entire site. It is like a Chinese version of Chicken Noodle Soup! Happy to hear the entire family enjoyed the congee!! My mother always used organ meats (chicken liver, hearts, and gizzards) in addition to chicken. How and when should I add them? Hello! Do you think I can double this recipe in a 8 quart? Also, I usually put carrots and other soft veggies in my jook when I cook it on the stovetop. When do you suggest adding these veggies in the IP? It will be close, but the 8 quart can probably double the recipe as long as you finish with natural release. For carrots, I would just add them with the chicken. For lettuce, I would add them at the end of pressure cooking. Jook has never been faster and easier! I usually make a pot of jook when I make a poached chicken to use the leftover poaching liquid. Now poaching the chicken is even faster! Great results. Great website also! You guys are my go-to for my Instant Pot recipes and timing information! Thank you so much for your kind words M Ng!! I just got my Instant Pot last week. I LOVE jook and made this today. Delicious!!! Next time I will add some shitake mushrooms and use boneless/skinless thighs since I found it a challenge fishing out all the smaller pieces of bones from the drumsticks. Thank you for such a great and easy recipe, can’t wait to try some of your others! On a side note, the bone adds quite a bit of flavor to the jook. My kid is sick so I wanted to make her a quick batch of congee to sooth her tummy. Your recipe was super easy and quick, not to mention delicious! Thank you this one is a keeper in my books! Thank you Wobbles. Hope your daughter will recover soon. The chicken congee was excellent. We used three chicken thighs instead of 5-6 chicken legs. My wife adds a little soy sauce to her bowl to enhance the flavor and add a little salt. Wish you & your family a wonderful Christmas holiday & blessed New Year! This was incredibly easy! I followed your instruction except that I tossed in 6 frozen drumsticks and 1 portion of frozen salmon. I upped the pressure cook time from 30 to 35 min, and it turned out unnecessary as the chicken pretty much fell off the bone by then. I love how I don’t need to thaw the meat and I can just cook whenever I want. My family loved it! So happy to hear you family loved it. It will only take 1 or 2 minutes extra when the frozen meat is fully submerged in liquid. Do I make any changes to the recipe if I use calrose rice instead of Jasmine rice? You will want to use about 25% – 30% more rice. I must thank you for this recipe . I had knee replacement surgery last Monday and come home Wednesday, was doing ok but yesterday and today got quite nauseous, today couldn’t even keep down. I was thinking, what could I make that would be very gentle and your recipe came to mind. I had to use what I had on hand, chicken breasts and powdered ginger. And it’s so good and comforting! I also got some anti nausea meds from the Dr, so I was able to eat it and keep it down. My boyfriend added hot sauce but I had it plain. Thank you! This will be my new go-to! Please take care & have some good rest!! Thank you for the fantastic recipe! I’ve made this twice already, with great success (my first recipe after purchasing the instant pot!) I do have a question about the natural release. You mentioned in some of the comments that it should take about 20-25 mins for the float to drop for natural release. When I did it, 40 minutes had passed and the float button was still up. I turned off the pressure cooker, and it dropped after a couple of minutes. Should natural release take this long? I have the DUO60 model. Thanks! The natural release will depend on how much food and how much pressure is in the Instant Pot. If the floating pin doesn’t drop after about 25 minutes, you can carefully turn the venting knob to the venting position to release the remaining pressure. You will want to do it slowly by turning the venting knob just a little. Does that mean 30 mins on high then 30 mins on natural release? The natural release should take roughly 20 – 25 minutes for this recipe. Can you make congee(jook) with brown rice? Do you have a good recipe for that? Since brown rice congee is usually thicker, I would reduce the water by a cup. I did it! It’s perfect jook! I love it! No more babysitting the pot of jook by the stovetop, and making sure it’s not sticking to the pot. No mess! You guys are so great! I love jook in general and this recipe will be one of my favorites! Hehe, making jook in the Instant Pot is so much easier than stovetop! thanks for your reply. The recipe was absolutely perfect. I added fried shallots and crispy garlic, and chopped spring onion on top. I also added green prawns just stirred in at the end, off heat. The heat of the porridge was enough to cook them. Served it with the crispy Chinese doughnut (youtiao). I love love loved it, and my husband was a convert! Now I can have my congee fix whenever I want. So easy! Glad to hear your husband is a convert now!! qt pressure cooker, not the Instant Pot. How do I modify this recipe?. Does the liquid need to be adjusted? Is the cook time 30 minutes from when I first turn on the stove, or 30 minutes after the pressure cooker has reached the high pressure? Thank you! The liquid or the recipe will not need any adjustment. The cooking time is 30 minutes after the pressure cooker has reached high pressure. I just bought the mini 3QT. Can I use the same recipe or should I use half the recipe? Much thanks! For this recipe, I would cutting it in half for the mini. Thanks for asking this, I was just wondering the same! I would like to make this with the leftover Costco rotisserie chicken that we have (oh yeah, you know what I’m talking about!). Are there any changes to the recipe if using cooked chicken instead of raw chicken? The cooking time can be the same or decrease by 5 minutes. Make sure to add the bones as they are full of flavors! Thank you so much for this recipe – congee is my absolute favourite, and finding a good one is a joy. I have not made my own before, so very keen to try, and I am heading to my local Asian Grocery Store this afternoon to gather some ingredients (fried shallots, crispy garlic, and some youtiao). I wanted to ask, can I half the recipe successfully? Would I use the same cooking time? There is just my husband and myself. Yes, halving the recipe will work with the same cooking time. I just made this lovely congee for the first time, and it’s my first time making congee ever. Wow!!! It was so easy, and so tasty. My Jewish mom is a bit of a congee snob, and she said it was better than the restaurants. I used chicken stock instead of water. And added a touch of sesame oil and fish sauce. Thank you Jacky and Amy! Thank you so much for your kind words and so glad to hear it came out so well! I’m new to the instapot world. What settings do I cook the rice at and for how long? Then after that, I just open and put in the rest of the ingredients and cook that for 35 mins? There isn’t a NPR, just sautee after that? The easiest way is to dump all the ingredients into the Instant Pot and cook them using the manual button for 30 minutes. Natural release means letting the pot sit there until the floating valve (metal pin) drops. Is that possible? if so, what would be the changes? Thank you for all you do. I made the recipe tonight and the family loved it. Can’t wait to try others! I did 1:9 ratio and it was the perfect texture. I used to make this on the stove but you have to stir it often or it will scorch. This was super easy and really delicious. I will only make it this way from now on. Thank you so much for the recipe, Jacky and Amy. Thank you for your well researched recipes. This one came out well. I’m looking forward to experimenting with this one and many of your others. Hi, thanks for sharing this recipe. Does it make any difference from your initial recipe to pressure cook the rice first for 15 mins and then cook the chicken for another 20 mins? The chicken will be more moist with the initial recipe, but there is a chance of failing if the water to rice ratio is slightly off. We have decided to use this method as it is more fail-proof. I tried your century egg congee recipe today and it was delicious! Can’t wait to try this one next! I just tried this jook recipe. Wow! Didn’t think I was going to enjoy it so much! This was an easy, quick and great recipe. Could I use basmati rice? Basmati rice is less starchy so it will come out less creamy. My Instant Pot arrived today… perfect timing as I was craving for chicken congee. Found this recipe and couldn’t be happier with how it turned out!! For an IP newbie, this recipe was so simple to make, you really can’t go wrong with it. It was so flavorful, both husband and I are multiple servings! For the condiments, I added fried shallots, chilli oil and a bit of soy sauce. I also added youtiao (Chinese fried dough). All of these can be found in your local Asian store. Thank you Amy and Jacky for such wonderful recipes! Can’t wait to try others! Hello, I made your congee as directed. I have never heard of congee before I seen it here. It was really good. My questions are: Can you salt/season it before you cook it? Also I want to make 2 batches, does it freeze well? It is better to season at the end of cooking so you can taste and adjust. It’s great to hear from you again Vivian!! I have fixed the star rating for you! I recently moved to Colorado, away from my parents and their delicious restaurant.. I’m beyond thankful for instant pot and this blog! This recipe brings me back to my childhood eating gung-gung and poh-poh’s food. I look forward to future recipes this dream team comes up with. Thank you, thank you, thank you! We are so happy to hear the recipe reminds you of childhood!! Since you are in Colorado, you may want to look at this high altitude cooking chart. It’s my first time using the instant pot and I would like to make a duck congee with brown rice. should I use the same recipe? I would reduce the liquid by 1/2 cup – 1 cup as brown rice congee is usually thicker. I saw in the reply below that u mentioned if it’s brown rice ..the water should be 5.5 cups.. so should I use 5.5 cups or 6.5 ? 5.5 cups – 6 cups will be correct. Hello! Would this recipe work with a whole 3lb chicken? Yes, make sure the whole chicken is directly submerged in the cooking liquid. I have just gotten my Instant Pot after months of debating & haven’t looked back since. Before, I used to spend two hours and stirring every 20 minutes to produce congee like my Mums but this recipe is amazing & frees up my time too! Plus the chicken is so tender & delicious. Thank you so much! Can’t wait to try this recipe. Do you think I can double the above recipe in my 6qt Instant Pot? Have you tried that or shall I do two separate batches? Doubling the recipe will exceed the safety limit so I would recommend doing two separate batches! Thx for your speedy reply! I have a couple more follow up questions. Do you think if I started with 7 cups of boiling hot water it will come to pressure faster thus making the entire cooking time quicker? Also, I was thinking once I NPR rather than sauté in IP to desired consistency I can transfer to stovetop so I can start on second batch right away. Thoughts on the above? The cooking time will have to be increased if starting with boiling hot water so I would recommend not to do it. Hi, I’m currently fighting the nasty. Old and have this going in my IP right now. Question: why do you use 30min manual high pressure instead of the “porridge” function? Cee, hope you will have a speedy recover!! Some of our readers use stovetop pressure cookers and other brands, so using the manual button will be a lot easier for everyone! I love this recipe. The congee turns out so tasty. I want to also add squid and fish to make it more of a seafood congee. Should I put the squid in at the same time as the rice and ginger? What is the best way to add the fish? I would love any tips you can give. Thanks! As for seafood congee, I would try using fish stock or shrimp stock in place of half of the water. It will depend on what kind of fish and what cut. If it is large pieces of fish with bones, it will be great to put some in at the same time as the rice and ginger. Squid and small fish meat slices require very short cooking time, they will be fully cooked in ~5 minutes after the pressure cooking stage. My wife will only eat chicken breasts. If I was to substitute breast meat, how many pieces and would it alter the cooking time? I would say about 2 – 3 pieces. The cooking time will be the same. Thank you so very much for this recipe. Jook was my favourite breakfast in Thailand and I’ve not been able to re-create it in Canada, until now! The second time I used some chicken broth as well as water and threw in a couple of pieces of frozen cooked pork (from our pigs). It came out perfect and the consistency I wanted. I stirred a fresh farm egg into each bowl to cook and again, it was perfect. Have I used perfect too much….no, I don’t think so. Think of an old lady doing a happy dance….that would be me. Better than the Sam Woo (Canton Bbq restaurant) by my house. This is the only way I’ve been able to make such awesome jook and so hands off too. I’ve made this so many times. Adjusted to 6 cups water because I prefer thicker consistency and can always add water if needed. IMO, your method for jook is my favorite recipe on your site…so far. I can’t believe I haven’t commented on this recipe before. Thanks for your trials and experimentations to offer us the best times & techniques. Thank you so much and have fun cooking!! Thank you so much for the recipe and how to use the pressure cooker! I have a new instant pot and just whipped out congee for lunch today! I sauteed a little garlic and the whites of the spring onions first and used forbidden rice. Yum! Can’t wait to check out your other recipes! First recipe I tried in my new duo-80 and it was great! Thanks for your diligence in creating this excellent recipe. I noticed in other comments you suggested that the recipe could be doubled but when I put double into my pot the ingredients were almost up to the max line on the inner pot. My instruction book that came with the IP specified not filling the pot more than half full when cooking starchy food so I took half of everything back out and followed your recipe measurements. I want to make the largest portion possible in my pot. What is your advice? You are right. I just went out to put the ingredients into the DUO80 to see how full it is and it is too full. This very recipe is in my pot right now. Already the kitchen smells amazing. I will add a “secret ingredient” though. I crack a raw egg into the bottom of my bowl, then add the piping hot congee on top of it. Wait 10 minutes for the hot congee to cook the eggs a little before digging in. Adds an amazing milky texture, and the flavor the egg brings helps too. I was initially SO EXCITED to try this recipe. I followed the instructions exactly, with the only exception using brown rice instead of white, which I didn’t think would make a huge difference. This turned out to be a watery soupy mess! 🙁 More like chicken soup instead of congee & I was so excited for that thick rice porridge. Needless to say, highly disappointed in this recipe.
? : How long did it take to naturally release after the manual high pressure cook time & how long to sautee? The only good thing is I know how to make chicken soup in my instapot now. If I were to do this recipe again, I’d half the water or triple the amount of rice. Perhaps that sautee step wouldn’t be needed, either. p.s. I’d gladly accept any suggestions as to what you might think went horribly wrong here. thank you for your comment. Brown rice was the problem as it is not as starchy as Jasmine rice. You will have to reduce the water to a 5.5 cups ratio. Thanks for your response. I ended up cooking extra brown rice, added it to the congee & then boiled it again. Will definitely make again with more rice & less water next time. Incase it helps others, I also added a clove of crushed garlic to the pot. I topped the congee with sesame oil, soy sauce, & green onions. Adds great flavor. Hopefully it will be better the next time! If I’m using frozen chicken would there be an adjustment of time? Thank you so much for your site! For this recipe, you don’t have to adjust the timing! First, thank you for all of your amazing recipes. I can really tell that you take the time to test each recipe to make it the best possible version. Thank you! Second, is it possible to use the standard american long grain rice in place of the Jasmine rice, or will I be messing with the magic of the recipe? Last question, Can I use bone in, skin on thighs instead of drumsticks? My store usually has specials on these types of meat. I would think standard American long grain rice will work in place of the Jasmine rice. It may need to be thicken at the end by stirring for a few minutes with the saute function. This looks amazing! Have you ever added vegetables to this? I only have chicken thighs (boneless skinless). What would be the time adjustment? Oh and love love your recipes! 25 minutes + Natural release will work. The congee will come out less flavorful without bones. I bought the IP-LUX60V3 Instant pot and you can’t chose high pressure unless you also chose one of the settings (excluding manual and rice) which setting should I chose? I’m trying it with meat/stew which hopefully will work. None of your recipes are for this model. Any thoughts n how to use your re pies for this model? The LUX operates in a single high pressure mode so most of the recipes will work for this model unless the recipe states low pressure. I’m so impressed, I’ve been forwarding your recipe to everyone and their mothers!! I can’t wait to try your other recipes. Question, since the hundred year egg is ready to eat, at what point do you recommend I add it in the cooking process? A million thank yous and hugs!! The hundred year egg should be rinsed and add after the pressure cooking process. Hi guys! Really love the recipe 🙂 I tried it already with white rice and it was amazing! Do you know what adjustments are needed to make it with brown rice? Thank you!! Brown rice congee is usually thicker than white rice congee. Help!! I just put in the instant pot and forgot to rinse the rice. Is it going to be ruined? Hope you & your boyfriend get well soon!! Take care & have a blessed New Year! Hope you had a wonderful Christmas, and may your new year be filled with love, joy, and blessings! Didn’t even know how I got here but I’m so glad I found your website. Left Hong Kong when I was 9 and where I live don’t always have authentic Chinese food. Thank you for sharing your inspirational story. My father who is in his 80’s suddenly went blind several months back. Giant Cell Arteritis. Haven’t even heard of the name before then but devastating for everyone nevertheless. We have to find a way to find the joy in life no matter the circumstances. I tried this chicken congee recipe and it was delicious. I have the 8 qt Instant Pot and would like to double the recipe. What changes should I make in regards to time and amount of chicken tip be used? I also added 7 pcs of Conpoy the last time. Made it more delicious. Thank you for sharing your story with us. It’s real difficult seeing our parents age day by day and it really hurts our hearts seeing them go through various health issues along with the emotional hurdles. But yes! Treasure the moments and support them by walking beside them. Pray that your father & your family can stay strong at this time. Please take care! Regards to doubling the recipe, just double everything. The pressure cooking time will remain unchanged. Very excited to try this tomorrow but wanted to double the recipe. I have the duo-80. Is this possible? What adjustments do I need to make… do I just double everything? and what does 1 rice measuring cup mean? Is this the plastic measuring cup I got with my pot? Thank you!! It is possible to double the recipe in the DUO80. Yes, double everything except the pressure cooking time. The pressure cooking time will remain the same. This looks yummy!! Can leftovers be stored in the fridge? And what’s the best way to re-heat gen next day? Thank you! thank you for your comment. Yes, leftovers can be stored in the fridge. When you drop raw chicken into the Instant Pot and cook it with the broth, doesn’t the marrow get released which causes brown gunk to rise to the surface? Or is it not too noticeable because it’s mixed in with the rice? Usually when I make Chinese soups or braised dishes, I blanch the meat for 5 min to get the impurities out. Would I need to do that for this recipe? Thanks! For a significant amount of marrow/minerals to get released, you’d have to be cooking on high pressure for about 180 minutes (the recommended setting for bone broth extraction). Hi. Im going to try this tonight. All I have are chicken tenders. Can i use them and if so shall I adjust the cooking time? Yes, chicken tender can be used. Throw in some chicken bones if you have some on hand as chicken tender has less flavor when compared to bone-in drumsticks. Since chicken tender is lean white meat, you may want to cook the chicken tender separately for 5 minutes + 8 minutes natural release first. Shred and season them with sesame oil, white pepper, and salt. Add them back into the congee after pressure cooking. Thank you for the pi dan pics. Will hunt for it. Yes i have the 6 qt 7-1 duo. So good. Will have to make it agan tomorrow!!! Can you show me the pi dan packaging i want to cook with it? I tried buying once but i think i bought the wrong one. Do i have to just rinse it and put the pi dan in with the rice? Pi Dan looks something like this. Sorry, we didn’t take a picture of our actual package. I just made it. So good. If i want to double the recipe how much water should i put and also should increase the time? Are you using the Instant Pot DUO60? I would not recommend doubling this recipe as it will have exceed the capacity for pressure cooking foamy food in the DUO60. Great and easy recipe! I just tried it tonight and it was delicious. I was thinking some sliced shiitake mushrooms might be nice. Would adding them to the pressure cooking phase make them too mushy? Thanks! Shiitake mushrooms hold up well in the pressure cooker. It shouldn’t come out mushy! Hi, do I have to rinse the rice first? What’s the difference if I don’t? Thanks! There is actually an ongoing debate about if we should rinse the rice first. I personally use both methods. If we rinse the rice first, it will wash away some of the starchy content and will make the congee less starchy. Sorry, is it 6.5 cups or 7? Thanks! This reminds me of visiting my grandma in Thailand. We’d get the Jook from street carts every morning!! Is it possible to 1/2 this recipe? It’s just the hubby and I and this seems like it would make way too much for us. Just received my IP the other day and I love your website! Very excited to try your recipes!! Yes, It is possible to make 1/2 of this recipe!! The cooking time will stay the same. Just want to let you know that this recipe yields about 4 big bowls of chicken congee. Hi. What changes should be made if using brown rice? Any changes to water to rice ratio and cooking time? Hi there. When I add the chicken, would the recipe still work if at that time I also added a chopped up cauliflower as well? I want to get some veggies into my kids. The fact that the cauliflower would be overcooked wouldn’t be a problem. Made the pork version (based on your reply to a comment) and it came out DELISH! Gonna make it again, it was so good! Glad you enjoyed the congee! Any recommendations for how to make salmon congee in the pressure cooker? Thanks! Stir in salmon and simmer until the salmon is perfectly cooked. This recipe interests me and is exactly the comfort food I ate growing up. Do you use the chicken drumsticks with or without the skin? Will leaving the skin make the porridge too oily? Also, do you recommend making this recipe with the thousand year egg (similar to the other porridge recipe with the pork)? Yes, we love using chicken drumsticks with skin for porridge as it gives a slightly smoother texture to the overall dish. Some cooks love to soak the rice in salt and oil prior to cooking the porridge to achieve a similar result. I personally like thousand year egg the best with pork as the flavors really complement each other, but some people do make it with chicken as well! You can try both recipes with thousand year egg and let us know what you think! After the first step – before adding the meat, is it really NR 5 min then QR ? I’m not sure if I accidentally counted 6 cup instead of 7 cup… when I QR, there was *so* much liquid spurting out. The condensation cup filled out and there was lots of liquid releasing. I’m hopeful that I just miscalculated the cups of water, and that was why I had this problem. Will definitely do this recipe again. Tasted and came out great. Thank you! The rice may have been too thick in the pressure cooker to cause the spilling. – the additional 5 minutes natural release could have caused the rice to cook and thicken more. if it happens again, you can always put the chicken together with the rice and cook for 35 minutes instead of using the 2-stage cooking method. I tried to “supersize” a double batch in my stovetop 10 qt canning pressure cooker and got rice burned onto the bottom. I don’t think the “do not stir” directions can be followed using stovetop p.c. pots because it is too thick. Without an electric p.c. to monitor the burning, careful heating must be applied to avoid burned rice. Luckily the burned flavor did not spoil the entire batch, but the loss of the burnt rice made for a thinner jook consistency. I will have to try again with a lower flame and see if it’s possible to avoid the burning. Please let us know how it goes with the lower flame. If it still doesn’t work, I would like to recommend throwing all ingredients in at the same time, cook at high pressure for 30 minutes, then natural release for 15 minutes. Open lid, season & stir until desired consistency over medium heat. How would I adjust the recipe if I wanted to make fish congee with boneless fish fillets? Or pork congee with pork bones & minced pork? These are just some of my favorite congee recipes! For fish congee, you can add the boneless fish fillets and pressure cook for another 10 minutes. For the pork congee, you can add the pork bones in the beginning and add minced pork at the 2nd step to cook for another 10 minutes. Thank you so much for the instructions! I’ll be sure to make some delicious congee tomorrow! Step 7 reads “Heat up the Instant Pot…”. Isn’t the pressure cooker already in use with the cooked rice? Are you using the saute function to saute the rice and chicken after they have finished pressure cooking in the Instant Pot? The Instant Pot will automatically goes into keep warm mode after the pressure cooking cycle is finished. After you have opened the lid, you will want to heat up (using the saute button) the Instant Pot again to thicken the congee a bit.